Kimono Dressing | Ready, Set, Kimono! I’m exhausted. I’m beat. I’m ready for an early night. But instead, I’m sitting up writing about what I did all weekend, because I’M PUMPED!!!! Why? Because I’ve been working with kimono all weekend! I took a break from my license practice in order to volunteer my time. 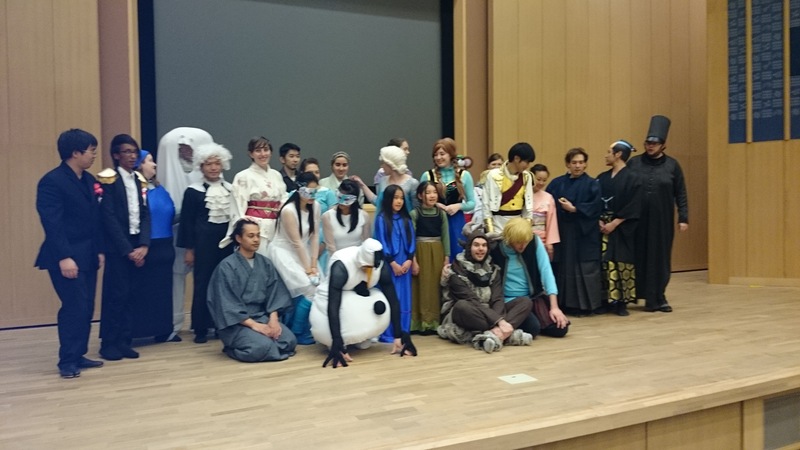 Every year, the English teachers in my small Japanese town put on a musical in English. This year, they did Frozen, but with a Japanese twist. While most of the main characters have their own unique and recognizable style, a lot of the side characters had to have their own costumes designed and created. 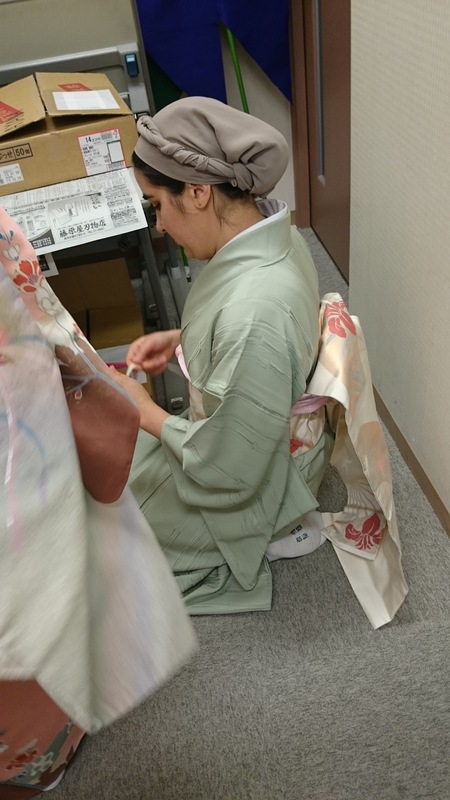 The story has been changed to take place in Japan, and to convey this fact, we raided my kimono closet to put together costumes for many of the side characters. And a few of the big ones too! the whole cast fully costumed. 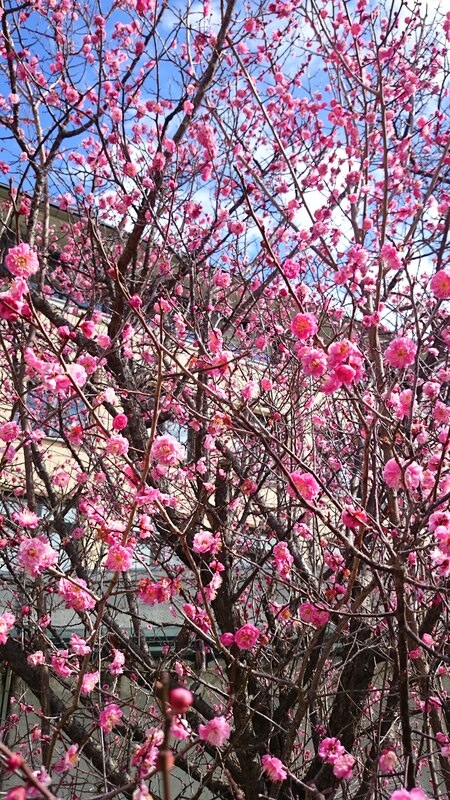 It’s a mix of western, instantly recognizable, and kimono. The only big characters that I get to dress are the Count of Wesseltown, but in this case, he’s been changed to the Daimyo of Osaka (with Obaka being the mispronounced version of his home!). He and his bodyguards wear kimono and hakama, and I had to learn hakama dressing in order to get them dressed. Prince Hans has experience with hakama and gave me a crash course this morning on tying them. Everyone’s hakama stayed in place during the performance, so I was very pleased! 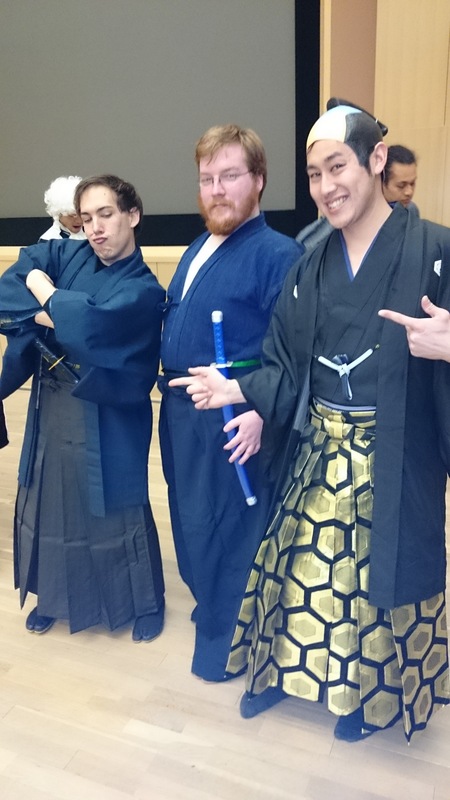 The Daimyo of Osaka/Obaka (in the gold and black hakama) and his two bodyguards. Despite my lack of knowledge on hakama kitsuke, the men are the easy ones for me. They get dressed before the curtain goes up and they never change costumes. The women on the other hand, all have to be dressed in kimono, take the kimono off for a costume change, then put the kimono back on. And some (most?) of the costume changes are really, really, fast. On three separate occasions, I have six minutes to get two ladies dressed completely in kimono, two minutes to get one lady dressed, and about eight minutes to get three ladies dressed. I’m exhausted by the end! I’ve also gotten creative with my kitsuke to make it as quick as possible. 1. For anybody wearing a polyester kimono, I’ve sewn in a ohashori. 2. I taught everyone how to tie the obi makura in place and how to tie the obi age. While they’re doing that, I can fiddle around with the otaiko at the back. 3. Anybody with an exceptionally quick costume change must have on their padding and eri sugata underneath their other costume. It gives a bit of a hunchback look, but not something that is too noticable on stage. 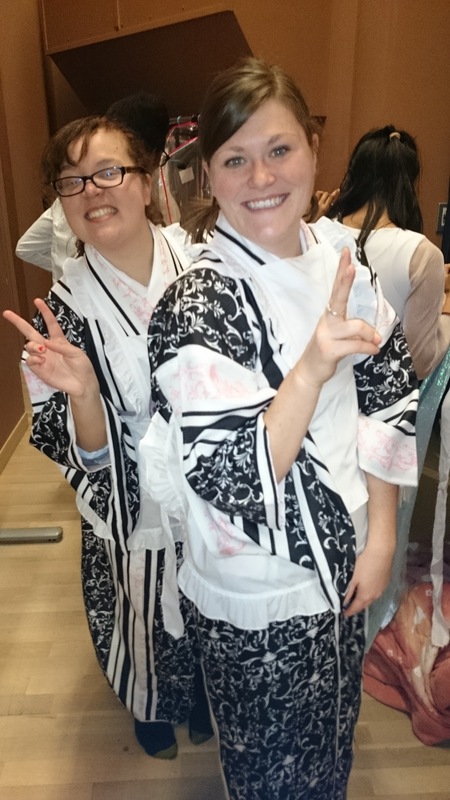 The two maids in their matching kimono. One of these ladies I have to get into kimono, obi, and apron in two minutes flat. One of the party guests in her kimono. She’s one of the three that I have to get dressed in eight minutes. She’s so short, I actually have the “problem” of having too much fabric to work with! Another party guest. And another lady that I have to get dressed in eight minutes. I love her headscarf. She brought in three that could match and took a survey of the cast. This one was the winner. 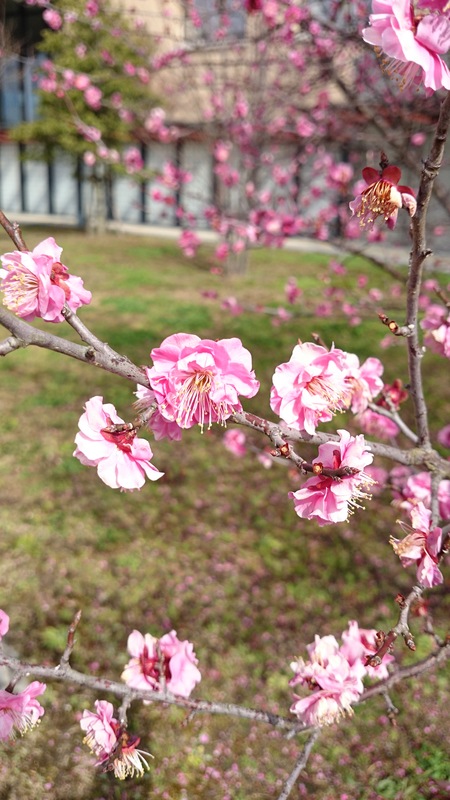 after all the frantic action of the day, it was really nice to come out and see that the ume blossoms have finally started to come out! And I just want to apologize for the poor quality of the photos. My phone doesn’t take nearly as nice photos as my actual camera. Thanks for reading everyone! This between this musical and my license practice I haven’t had any spare time to blog as much as I want to, but my schedule will lighten up late next month so expect some exciting things then! Thanks! 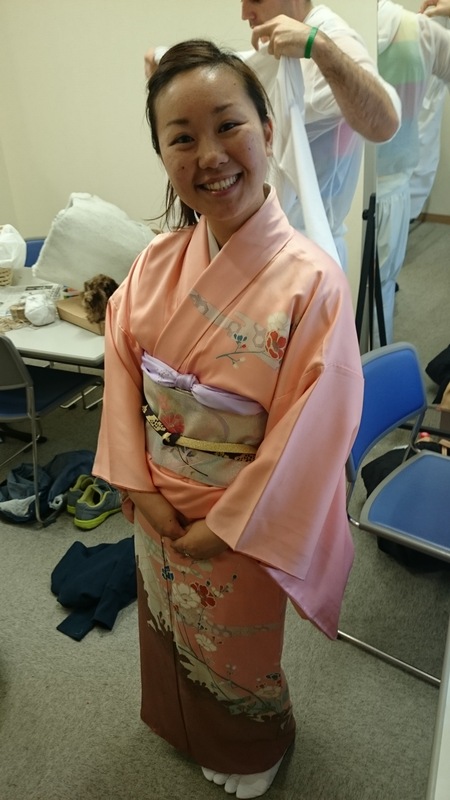 Pingback: Kitsuke Dressing: The Performances | Ready, Set, Kimono!